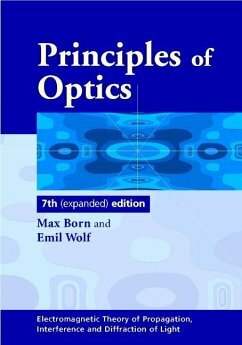 Principles of Optics is one of the classic science books of the twentieth century, and probably the most influential book in optics published in the past 40 years. The new edition is the first ever thoroughly revised and expanded edition of this standard text. Among the new material, much of which is not available in any other optics text, is a section on the CAT scan (computerized axial tomography), which has revolutionized medical diagnostics. The book also includes a new chapter on scattering from inhomogeneous media which provides a comprehensive treatment of the theory of scattering of scalar as well as of electromagnetic waves, including the Born series and the Rytov series. 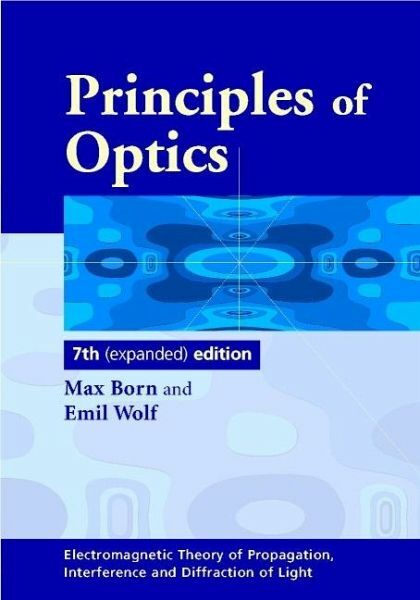 The chapter also presents an account of the principles of diffraction tomography - a refinement of the CAT scan - to which Emil Wolf, one of the authors, has made a basic contribution by formulating in 1969 what is generally regarded to be the basic theorem in this field. The chapter also includes an account of scattering from periodic potentials and its connection to the classic subject of determining the structure of crystals from X-ray diffraction experiments, including accounts of von Laue equations, Bragg's law, the Ewald sphere of reflection and the Ewald limiting sphere, both generalized to continuous media. These topics, although originally introduced in connection with the theory of X-ray diffraction by crystals, have since become of considerable relevance to optics, for example in connection with deep holograms. Other new topics covered in this new edition include interference with broad-band light, which introduces the reader to an important phenomenon discovered relatively recently by Emil Wolf, namely the generation of shifts of spectral lines and other modifications of spectra of radiated fields due to the state of coherence of a source. There is also a section on the so-called Rayleigh-Sommerfield diffraction theory which, in recent times, has been finding increasing popularity among optical scientists. There are also several new appendices, including one on energy conservation in scalar wavefields, which is seldom discussed in books on optics. The new edition of this standard reference will continue to be invaluable to advanced undergraduates, graduate students and researchers working in most areas of optics. Historical introduction; 1. Basic properties of the electromagnetic field; 2. Electromagnetic potentials and polarization; 3. Foundations of geometrical optics; 4. Geometrical theory of optical imaging; 5. Geometrical theory of aberrations; 6. Image-forming instruments; 7. Elements of the theory of interference and interferometers; 8. Elements of the theory of diffraction; 9. The diffraction theory of aberrations; 10. Interference and diffraction with partially coherent light; 11. Rigorous diffraction theory; 12. Diffraction of light by ultrasonic waves; 13. Scattering from inhomogeneous media; 14. Optics of metals; 15. Optics of crystals; 16. Appendices; Author index; Subject index.